Tomorrow we celebrate American Independence Day, which memorializes the adoption of the Declaration of Independence. This was the day the Continental Congress approved the final wording of the Declaration of Independence, having already declared the independence of the Colonists from the authority of the British Crown on July 2, 1776. 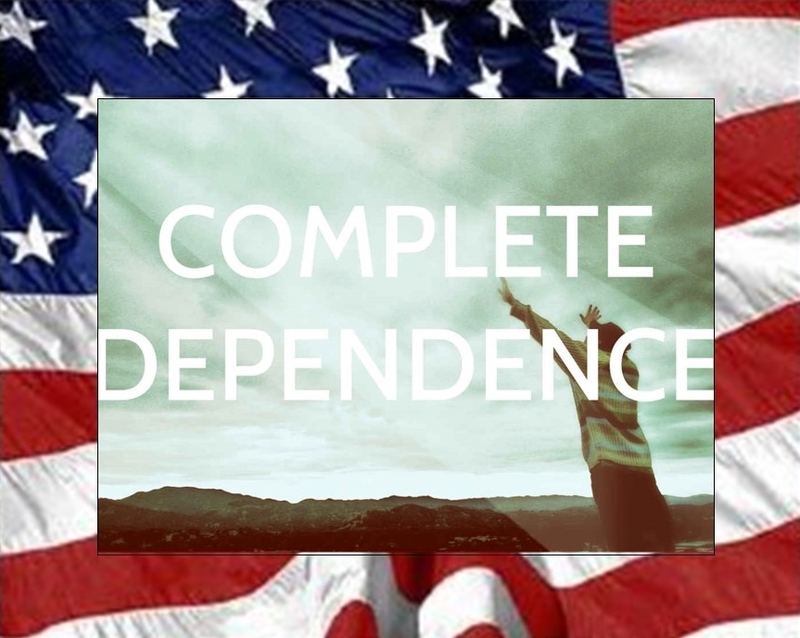 Now, as important as this day is in the life of our great nation to recall our independence, I pray that you and I will remember to declare our utter dependence upon God—not only this day, but every day on this side of heaven. As a pastor, I am often confronted with Christians who mistakenly believe that our state of dependence began after Adam and Eve sinned against God. NOT TRUE! Before Adam and Eve committed their first awful act of cosmic treason, they were totally dependent upon God for everything. Their divine design was one of utter dependence upon Omnipotence. They were made by God for God and were never to live a single moment independent from God. Self-reliance and self-rule were never part of their divine design . . . no, this quest for autonomous rule was the rancid fruit of their rebellion against their Creator and Sustainer. The lies the serpent told Adam and Eve in the Garden convinced them to seek their independence from God and to live above and apart from the One who formed them and was sustaining them. But as soon as our first parents sampled the forbidden fruit, they immediately found out just how dependent they were upon God! Only now they were dependent upon God for His mercy and forgiveness, which they undeservedly received through the promise of a Savior. God would have been totally justified to strike Adam and Eve dead right on the spot to fulfill His perfect, holy justice, but He did not. What God’s justice required—payment for sin—God’s grace provided in the gift of His beloved Son, Jesus Christ. Adam and Eve were dependent upon God for life prior to sin, and they were dependent upon God for life after sin . . . through the cross work of Christ. When was the last time you considered just how dependent you are upon God? Most people immediately reflect back on a season of struggle, suffering, or sorrow and consider how dependent upon God they were to get through it. But what about the times in life when the sun is shining, the sky is blue, and the clouds are fleecy? We have a tendency to forget about our dependence upon God in seasons of plenty and prosperity. Regardless of where this finds you, your next breath is dependent upon God. The next beat of your heart is dependent upon God. Your hearing, eyesight and the circulation of your blood are dependent upon God. If God were not upholding you right now, life as you know it would instantly cease. This is true, not only for every person who has ever lived, but for everything that was ever created. Everything in the cosmos was created by God for God and is totally dependent upon God. As Paul wrote to the Christians at Colossi, “All things were created by him and for him. 17 He is before all things, and in him all things hold together” (Colossians 1:16-17). Everything under the sun originally existing as a holy hymn for God’s glory. So on this day of Independence, let us all be reminded of our total and utter dependence upon God, “for in him we live and move and have our being” (Acts 17:28). One last thought: the Bible makes it clear that the person who is most aware of his dependence upon God is the one who is most often pursuing God through prayer. The more you feel your need for Him, the more time you spend in prayer to Him. If your prayer life is short or shallow, you can be assured your sense of dependency upon God is short-circuited. John Piper wrote that “Prayer for God’s help is one way that God preserves and manifests the dependence of his people on his grace and power. The necessity of prayer is a constant reminder and display of our dependence on God for everything, so that he gets the glory when we get the help.” Dependence is a good thing when we are depending upon God, and our prayer life is one of the best indicators of just how deeply we sense and show our dependence. What better time than now, as we American’s celebrate Independence Day, to declare and celebrate our utter dependence upon the righteous, self-sacrificial, and benevolent rule of our gracious God?